Video-Based Home Intercom Systems – Should I Get One? Pacific Security > Blog > home intercom systems > Video-Based Home Intercom Systems – Should I Get One? We speak to a lot of people that believe that video-based home intercom systems are overkill for their property. Of course, everybody has to consider the risks, costs and benefits of owning one in their particular situation … but we honestly believe that many people simply don’t understand the full range of advantages for people with video-based home intercom systems. We check them out here! Every good video home intercom system is also audio-equipped. You can both see and speak to anybody knocking at the door. •The blocked light and muted noises from the other side of a peephole alerts the person out the front to the fact that somebody is home. Video door phones are much more discreet. •Peepholes distort your view of a person considerably. •Video home intercom systems can have a much wider field of vision, with wide angle lens models. When you install a video based home intercom system, you can install additional display handsets. Teach your kids that if they are home alone, they are to check who is at the door from one of the stations further distant from the door. Some shady characters will try to talk your kids into letting them into the house with pretty convincing sob stories. Teach your children to check on who is at the door from a distant home intercom system display, and if they don’t know the person, or they haven’t been in the house before, to simply ignore them. Some home intercom systems also allow you to remotely unlock your door – so when somebody legitimate comes knocking, you can let them in from any corner of the hose where a handset is installed. 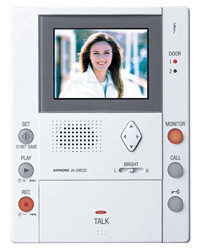 Many models of video home intercom systems are also equipped with a recording capability. You can press the record button while standing at the handset if you feel suspicious of any person that knocks at the door. Some systems can be set to monitor the front door while you are away. If you live in an area where door-to-door preaching and sales are common, you’ll probably appreciate being able to easily deter the next person who ‘just wants to check that you have the best possible phone plan, and possibly save you a lot of money’! With a video home intercom system, you can’t get dragged into long sales pitches. For the salesperson who just won’t listen, escape is as easy as hanging up the phone!